[S379] United States Federal Census, Washington, District of Columbia, Population Schedule: St Marys, Wake, North Carolina, Emuneration District: 142, Supervisor District: 4, Sheet: 4B, Dwelling: 68, Family Number: 72, Date: 1920. [S382] Donnell Bagwell, North Carolina Death Certificate: Donnell Bagwell. [S385] Eva Tendall Bagwell Grave Stone, Find a Grave, www.findagrave.com. [S381] United States Federal Census, Washington, District of Columbia, Population Schedule: St Marys, Wake, North Carolina, Emuneration District: 92-58, Supervisor District: 9, Sheet: 11B, Dwelling: 192, Family Number: 198, Date: 1930. [S394] Sherwood Frederick Bagwell, North Carolina Death Certificate: Sherwood Frederick Bagwell. [S395] United States Federal Census, Washington, District of Columbia, Population Schedule: St Marys, Wake, North Carolina, Emuneration District: 127, Supervisor District: 4, Sheet: 4A, Dwelling: 61, Family Number: 61, Date: 1910. [S396] Mildred L. Bailey Grave Stone, Find a Grave, www.findagrave.com. [S393] John Lester Bagwell, North Carolina Death Certificate: John Lester Bagwell. Her married name was Emory. Her Social Security Number was (an unknown value) at 244545463. Martha Elizabeth Bagwell was born on 13 December 1913 in North Carolina.1,2 She was the daughter of John Bryant Bagwell and Bertha Phillips.1,2 Martha Elizabeth Bagwell married (?) Emory. Martha Elizabeth Bagwell died on 28 August 1996 in North Carolina at age 82. 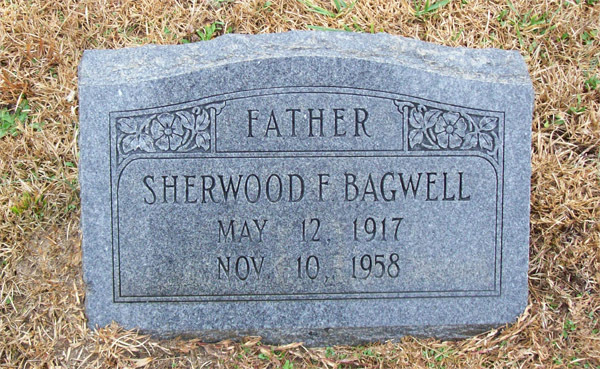 [S383] Sherwood F. Bagwell Grave Stone, Find a Grave, www.findagrave.com. [S389] Urias B. Bagwell Grave Stone, Find a Grave, www.findagrave.com. [S391] Mamie Blinson Bagwell Grave Stone, Find a Grave, www.findagrave.com. 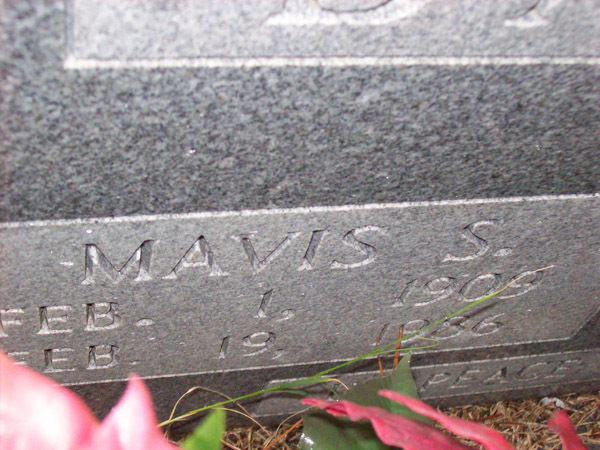 [S388] Mavis S. Bagwell Grave Stone, Find a Grave, www.findagrave.com. Larry Gene Bagwell was born on 29 July 1946 in Clayton, Johnston County, North Carolina. He was the son of Urias Bryant Bagwell and Mavis Spence. Larry Gene Bagwell married Charlotte (?) after 1960. Larry Gene Bagwell died on 2 April 1990 in Smithfield, Johnston County, North Carolina, at age 43. 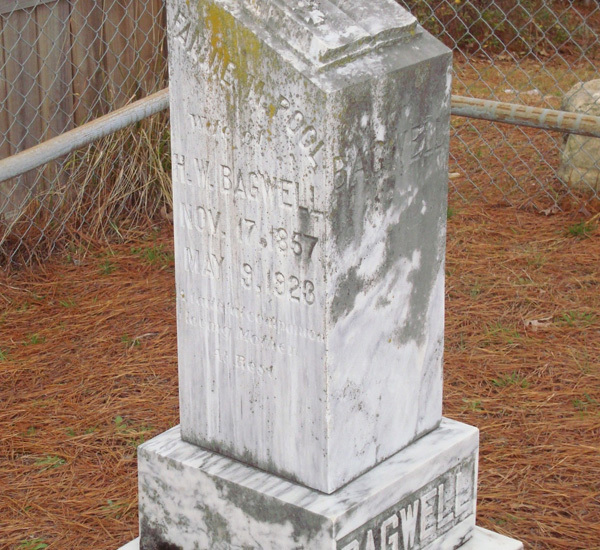 [S390] Virginia T. Bagwell Grave Stone, Find a Grave, www.findagrave.com. 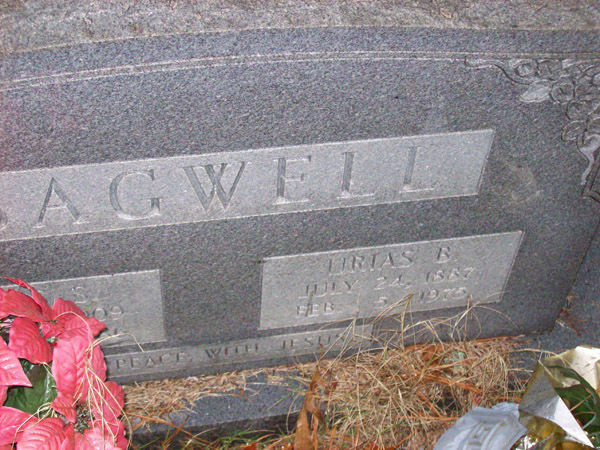 Annie R. Bagwell is the daughter of Urias Bryant Bagwell and Mavis Spence. 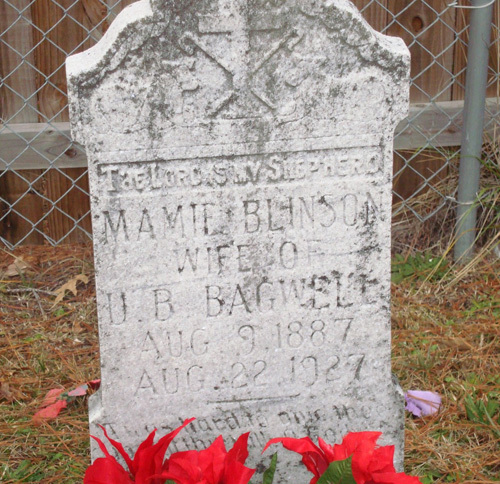 Mamie Blinson was born on 9 August 1887.1 Her married name was Bagwell.1 She married Urias Bryant Bagwell, son of Needham Bryant Bagwell Jr. and Hasseltine Tina Pool.1 Mamie Blinson died on 22 August 1927 at age 40.1 She was buried at Bagwell Cemetery, Garner, Wake County, North Carolina. Henry R. Wall was born after 1909 in Wake County, North Carolina. He was the son of Henry Peyton Wall and Patsy Bagwell.1,2 Henry R. Wall lived in 1975 in Raleigh, Wake County, North Carolina. Mary Ethel Newton was born on 28 March 1913 in North Carolina. Her married name was Bagwell.1 She married John Lester Bagwell, son of John Bryant Bagwell and Bertha Phillips, after 1928.1 Mary Ethel Newton died in April 1982 in Raleigh, Wake County, North Carolina, at age 69. She was buried at Raleigh Memorial Park, Raleigh, Wake County, North Carolina. [S398] Bertha Phillips Grave Stone, Find a Grave, www.findagrave.com. Grace Winnell Smith married Sherwood Frederick Bagwell, son of John Bryant Bagwell and Eva Tendall, on 4 January 1938 at Wake County, North Carolina. [S397] Herbert A. Bailey Grave Stone, Find a Grave, www.findagrave.com. (?) Emory married Martha Elizabeth Bagwell, daughter of John Bryant Bagwell and Bertha Phillips. [S401] Daniel Sappenfield Grave Stone, Find a Grave, www.findagrave.com. Mary Ellen Bagwell was also known as Bagwill. She was born on 6 April 1852 in Jackson County, Illinois.1 She was the daughter of Lloyd Bagwell and Sarah Ann Waddington.1 Mary Ellen Bagwell died on 27 July 1856 in Jackson County, Illinois, at age 4.1 She was buried at Hilton Park, Jackson County, Illinois.